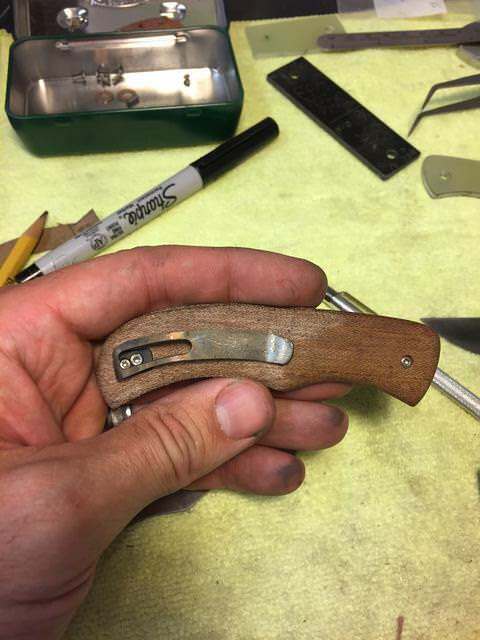 Making your own pocket clips? Who is making there own pocket clips for folders? 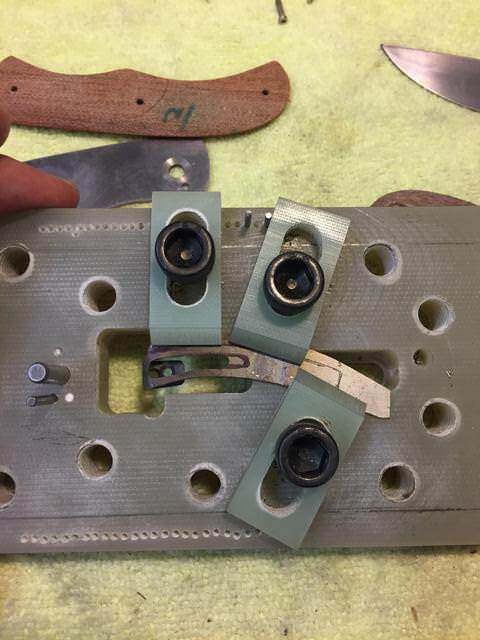 If you are bending them out of titanium any hints or tricks? I'm about to make one. I always made my own to suit each knife. Just put them in a vise using protection and make each bend. You'll need a small piece of wood as a pusher between bends. Don, do you typically bend it cold or heat it with a torch? I've only done it once. I used heat and it worked fine. Seems like Boss showed it in one of his videos too. Good question, Justin. I'd be interested in the responses as well. Heat with a torch or they will crack. How do you guys attach your pocket clips? Drill and tap the handle material or tap the liner and drill a clearance hole in the scale? I've both milled and bent pocket clips to fit my knife designs. You definitely want to use heat when bending either steel or titanium. I've seen dedicated clip brakes for bending which are really nice, but a vise, a dowel, a set of pliers, and a torch will get you there. I made my own Ti clip out of some .050 sheet and you definitely want to heat it as has been mentioned. I think .040 probably would’ve been slightly better for me. If you’ve done any sheet metal work before, there are definitely some similarities. Making hard angles is harder the thicker the material-you’ll get a slight radius where the material “bunches” up. I used a cereal box and drew on it then cut it up for a bit of a template. I put that on the Ti and cut that out oversized. I drilled clearance holes in the clip and scale, then tapped the liners. I wanted the clip to sit down into the scale, so I carefully marked the scale (micarta) and milled our a recess and kept checking for the fit. The clip is certainly functional and I’m glad I made it rather than using a pre-made one. I feel like making one to match the design of the folder helps add a nice touch. That being said, I learned a lot and hopefully the next ones will be nicer. Hope yours turns out how you want it. Some good info guys, I'm going to work on it this weekend so I will take a few pics of my success or failure. Well it now has a pocket clip. It's not the sexiest clip but it is functional and my first from scratch. Thanks for the help. It was harder then I thought bending it free hand, I can see where some kind of bending jig would be handy. Outstanding work Justin! I haven't tried bending a Ti clip. I'm planning on milling them. I've only done a hand filed/sanded Carbon Fiber clip for a Morpho Balisong. And it came out really nice. Planning on milling the Ti to the same effect. Yes if I had a mill I would try that to. I actually prefer a deep carry clip but I'm going to have to put my thinking cap on to figure out how to pull that off. That looks great. I like deep carry as well, so I bent mine twice so the part that attached to the knife was in line with the clip...if that makes sense...? I’ll try and find some pictures to post up to help show what I mean. It’s two 90 degree turns and it can definitely get a little wonky. But I like the result in pocket. Sorry it took a while to get these pictures posted. Here is an in progress one and with it on the knife. Hopefully it shows what I was talking about... 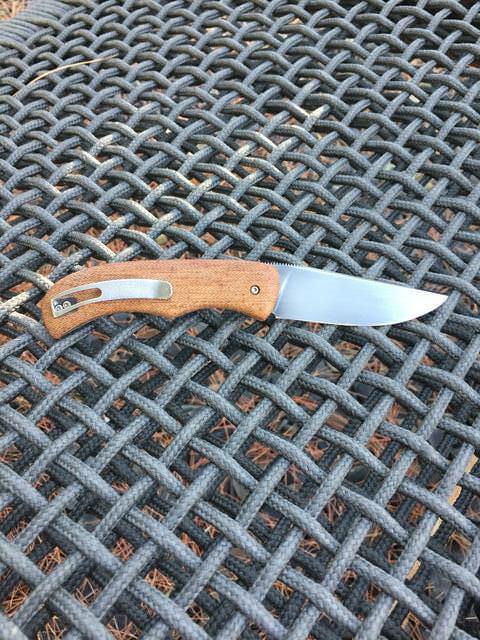 I milled a pocket into the micarta so the Ti on the clip is sunken into the scale.